The 7 Secrets of Highly Successful Sod | Gardens Alive! 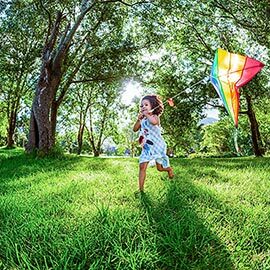 It's Easy to Have a Healthy, Weed-Free Lawn Without Chemicals—Just Follow These Seven Steps!
. Mike: Our substantial lawn is presently very weed-filled. What's the best plan of attack at this time of the year (and forward) for ultimately establishing weed-free turf? Mike: Thanks so much for your show's insightful information and encouragement. I am finally ready to fix my once beautiful, now weed-infested lawn. I think I caused the worst damage by 'weed and feeding' it in the middle of a drought and then not reseeding the bare spots I created. I am a poor school teacher (and a tightwad to boot!) What is the cheapest and easiest way to bring my lawn up to good health? We have some very stubborn weeds in our lawn, especially in the front, which gets a lot of sun. We would gratefully appreciate your advice and guidance. 1. Grow the right kind of grass for your region and conditions. In the North, you want to grow a 'cool season' grass like Kentucky bluegrass, rye grass or fescue; down South, you need a 'warm season' variety, like Bermuda, St. Augustine or zoysia. Sunny spots need a grass that thrives on lots of light, like Kentucky blue or Bermuda; shady spots demand a turf that can get by on very little light, like fescue or St. Augustine. 2. Prevent weed seeds from sprouting with corn gluten meal. 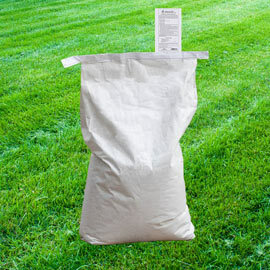 Applied in the Spring—when the forsythia shrubs in your neighborhood begin to bloom—this all-natural by-product of corn starch processing stops new weeds, weakens old ones and gives your lawn the perfect amount of slow-release nitrogen for strong roots and beautiful green growth; without nasty chemicals that threaten people, pets and the environment. See last week's column for more details. And gee…I wonder where you might be able to find some? 3. Cut your grass at the right height! Most people cut their grass way too short, thinking it will help them mow less often. But scalping your lawn of all its green forces the grass to try and grow super-fast to replace the solar collectors you executed. This weak new growth looks terrible, so you cut it again—way too soon and way too short—and again…and… Meanwhile, those roots aren't growing a tall—allowing weeds to throw wild parties with loose flora where your turf should be. 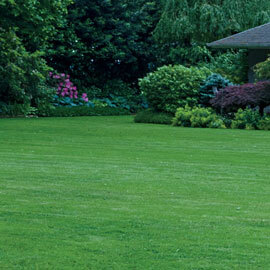 Your lawn should be AT LEAST two inches high AFTER YOU CUT—an inch higher for cool season grasses and shady lawns. Use a ruler! And never cut off more than a third at any one time. Your grass will grow slower (because you aren't trying to kill it anymore), look much greener than a crew-cut lawn, and form DEEP roots that crowd out weeds naturally. How deep? Our old buddy (and corn gluten meal creator) Dr. Nick Christians, turf grass Professor at Iowa State University, explains that a fescue grass cut two inches high will have 18-inch deep roots (which sounds pretty good). But if you raise the cutting height to the fescue-recommended three and a half inches, those roots will go down FOUR FEET—that's a lawn that can find enough water and nutrients to take care of itself! 4. Feed it right! Cool season grasses should get a big feeding in the Fall and a lighter one in the Spring never feed them in hot weather. Warm season grasses are the opposite—give them three equal feedings from early to late summer. If you use a mulching mower to return those nitrogen-rich clips to your turf, feed less; if you collect your clips for other uses, feed more. 5. Water correctly! A light sprinkling every day is the worst thing you can do—with no water to reach for down deep, roots stay shallow and weeds move in. Long, infrequent waterings = deep roots that stop weeds with a terse "and where did you think YOU were going?" Most lawns need an inch of water a week; if Nature provides this, sit on your hose. If she doesn't, apply that weekly inch (use a rain gauge) all at once on lawns in clay soil. But break it up into two, ¾ inch-deep soakings per week if your soil be sandy. Lawns in sun need more water; lawns in shade, less. Some grasses, like Kentucky blue, are notoriously thirsty; others, like Bermuda grass, like it dry. It is never wrong to water a lawn in the early morning; but it can be disease-inviting Death on a Stick to water in the evening—especially in the North. 6. Tap your local expertise. No matter where you get your basic lawn-care information, always fine-tune it with advice from your local county extension agent and their amazing volunteer Master Gardener helpers. Just type the word "extension" and [your state] into a search engine, and you'll find your local office at your state's web page. They can tell you what grasses work best in your specific micro climate, test your soil for problems, and even identify your current grass if you're clueless. (Note: They MAY recommend chemical treatments. If they DO, ask for organic options. If they won't provide them, ask US—we be here for you! 7. Don't be afraid to 'Take The Pipe' and start over. If you've been trying to grow a WAY wrong type of grass for your region and/or conditions, have nuked whatever you did have with chemicals (or over-attention), or have a 'lawn' that's more than 50% grass-free, start over. In the North, you should always wait till early Fall to seed a new cool season lawn; sod is much more expensive but can be laid anytime—just be sure and keep it well-watered till its roots establish. Down South, start your new warm season lawn in the Spring; some warm season grasses can be seeded; with others you plant plugs, sprigs or sod.